Congratulations to Associate Professor Dr. Neoh Hui Min! We are indeed proud to announce the promotion of our research fellow, Dr. Neoh Hui Min, to the position of associate professor effective from 29 th November 2016. This is indeed our first research fellow promoted as an associate professor since UMBI’s inception. Yes, we have had senior research fellows previously but all obtain their promotion to associate professor from the faculty. Dr. Neoh truly deserves this achievement. She has been the epitome of an outstanding researcher who is not only passionate about science but pays a lot of attention in guiding the junior staff members and also students. 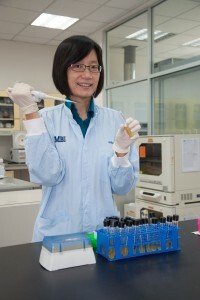 Dr. Neoh is a microbiologist and her research is focused on the multi-drug resistant Staphylococcus aureus, dengue, Chikungunya virus and Zika virus plus also microgravity science using Caenorhabditis elegans as a model. She has a total of 29 publications, 1080 citations and an H-index of 13 (Scopus). We congratulate Dr. Neoh and wish her all the best for the future.